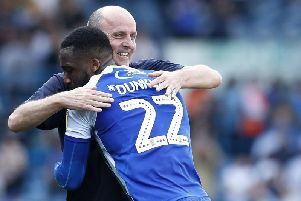 Paul Cook admits Wigan Athletic have to shape up at both ends of the field if they are to achieve their aim for the campaign – and remain in the Championship. This weekend sees Latics travel down to Reading for the very epitome of a six-pointer at the Madejski Stadium, lying only three points clear of the drop zone. And Cook knows Latics have to raise their game both in front of goal and at the back to avoid being dragged further into the dogfight. “There’s two ends of the pitch – and for too much of this season we haven’t been good enough at both ends,” he acknowledged. “All of a sudden we look quite solid at the back. The onus now is trying to find more at the other end. “We’ve got plenty of flair players champing at the bit for a chance. The clash is the second of three away games in a week for a side that has won only once on the road all season. “The three away games in a row are challenging, but it is what it is,” admitted Cook. “We’ve had a tough winter, with injuries and so forth. “But we’ve come through that, our squad is in great shape, and it’s up to us to produce some results. “We all want to retain our Championship status as quickly as possible. “And the only way we can do that is by putting points on the board. “As a manager I’m forever looking at our team and asking whether anyone could be giving me any more. Cook also called on his players to ‘do it for the fans’ after giving them precious little to shout about away from the DW Stadium. “We’ve had such a strong away support all season, it’s been absolutely outstanding,” he added. “I know how difficult it is for the fans – both geographically and financially – to follow the team around. “But it’s very much appreciated by myself and the team.